Golden Books Publishing Company, Inc.. Paperback. 0307812863 Please allow 4 - 14 business days for Standard shipping, within the US. Thank you for supporting our small, family-owned business! . Fine. 1995-06-01. Golden Books Publishing Company, Inc.. Paperback. 0307812863 Please allow 4 - 14 business days for Standard shipping, within the US. Thank you for supporting our small, family-owned business! . Fair. 1995-06-01. Golden Books Publishing Company, Inc.. Paperback. 0307812863 Please allow 4 - 14 business days for Standard shipping, within the US. Thank you for supporting our small, family-owned business! . New. 1995-06-01. Warner Books. Paperback. 0307812790 Please allow 4 - 14 business days for Standard shipping, within the US. Thank you for supporting our small, family-owned business! . Fine. 1995-01-01. 1st Printing. Warner Books. Paperback. 0307812790 Please allow 4 - 14 business days for Standard shipping, within the US. Thank you for supporting our small, family-owned business! . New. 1995-01-01. 1st Printing. 1995-01-09. New. Ships with Tracking Number! INTERNATIONAL WORLDWIDE Shipping available. Buy with confidence, excellent customer service! Grand Central Pub. Paperback. 0446602175 Please allow 4 - 14 business days for Standard shipping, within the US. Thank you for supporting our small, family-owned business! . Fine. 1995-06-01. 1St Edition. Grand Central Pub. Paperback. 0446602175 Please allow 4 - 14 business days for Standard shipping, within the US. Thank you for supporting our small, family-owned business! . New. 1995-06-01. 1St Edition. Grand Central Pub. PAPERBACK. 0446602175 New Condition. . New. 1995-01-09. Good. Ships with Tracking Number! INTERNATIONAL WORLDWIDE Shipping available. May not contain Access Codes or Supplements. May be ex-library. Shipping & Handling by region. Buy with confidence, excellent customer service! Grand Central Pub. PAPERBACK. 0446602175 Like New Condition. . Fine. Warner Books. Paperback. 0307812790 Please allow 4 - 14 business days for Standard shipping, within the US. Thank you for supporting our small, family-owned business! . Fair. 1995-01-01. 1st Printing. Time Warner Paperbacks. Paperback. 0751514209 Please allow 4 - 14 business days for Standard shipping, within the US. Thank you for supporting our small, family-owned business! . Fair. 1995-01-01. Film Tie-in Ed. Grand Central Pub. Paperback. 0446602175 Please allow 4 - 14 business days for Standard shipping, within the US. Thank you for supporting our small, family-owned business! . Fair. 1995-06-01. 1St Edition. Warner Books, 1995. MassMarket Paperback. Very good. Grand Central Pub, 1995. Book. Very Good. Soft cover. 1st Edition. mass market paperback, very light wear. 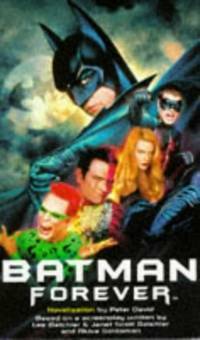 Val Kilmer as Batman front cover, Jim Carey, Tommy Lee Jones back cover. New York: Warner Books. Very Good with no dust jacket. 1995. Pocket-Pb. Owner Inscription; in ink inside. .
Grand Central Publishing, 1995. Paperback. Good. Disclaimer:A copy that has been read, but remains in clean condition. All pages are intact, and the cover is intact. The spine may show signs of wear. Pages can include limited notes and highlighting, and the copy can include previous owner inscriptions. At ThriftBooks, our motto is: Read More, Spend Less.Dust jacket quality is not guaranteed. Time Warner Paperbacks, 07/06/1995. Paperback. Used; Good. **WE SHIP WITHIN 24 HRS FROM LONDON, UK, 98% OF OUR ORDERS ARE RECEIVED WITHIN 7-10 DAYS. We believe you will be completely satisfied with our quick and reliable service. All orders are dispatched as swiftly as possible! Buy with confidence! Boston, Massachusetts, U.S.A.: Warner Books Inc, 1995. Movie tie-in fiction paperback, 1st printing, 6/95. Condition is near new, has light edge wear, slight tanning to pages, otherwise looks new..........**We have other books in this genre in stock and offer discounts in shipping on additional books, please contact us for more information**.....WRAPPED IN PLASTIC BAG TO PROTECT CONDITION OF BOOK.......Summary - Novelized, from the screenplay by Janet Scott Batchler, Lee Batchler & Akiva Goldsman.. First Printing. Soft Cover. Near New. NY: Warner Books. Good with no dust jacket. 1995. 1st Printing. Paperback. Moderate wear . Grand Central Publishing, 1995. Paperback. Good. Disclaimer:A copy that has been read, but remains in clean condition. All pages are intact, and the cover is intact. The spine may show signs of wear. Pages can include limited notes and highlighting, and the copy can include previous owner inscriptions. An ex-library book and may have standard library stamps and/or stickers. At ThriftBooks, our motto is: Read More, Spend Less.Dust jacket quality is not guaranteed. Grand Central Publishing, 1995. Paperback. Acceptable. Disclaimer:A readable copy. All pages are intact, and the cover is intact. Pages can include considerable notes-in pen or highlighter-but the notes cannot obscure the text. At ThriftBooks, our motto is: Read More, Spend Less.Dust jacket quality is not guaranteed. Boston, Massachusetts, U.S.A.: Warner Books Inc, 1995. Very good. Paperback, fiction.. Paperback. Very Good. New York, NY, U.S.A.: Warner Books, Incorporated, 1995. First Paperback Printing. Mass Market Paperback. Good - MOVIE EDITION. Brief summary ofcontent available upon request by e-mail. MOVIE EDITION with a front cover photo of Val Kilmer as The Batman and back cover photos of Tommy Lee Jones and Jim Carrey. Time Warner Publishing M/M, June 1995. Trade Paperback. Good. Creasing and slight slanting to the spine. Time Warner Paperbacks. PAPERBACK. 0751514209 . Good. Warner Books. Poor. 1995. (Film/TV tie-in). Paperback. 0751514209 . [POOR condition] (ink stain at base of spine - text readable, photos unaffected) (reading copy only) (Val Kilmer, Jim Carrey) (photo-insert) . Warner Books, 1995. Mass-market paperback. Good. No dust jacket as issued. Mass market (rack) paperback. Glued binding. Audience: General/trade. London, United Kingdom: Little, Brown & Company, 1995. This book has aq crease to the back cover. Mass Market Paperback. Good. Time Warner Paperbacks. PAPERBACK. 0751514209 Book is in good condition. Cover has some wear. Creasing present. Discolouration present. Fingermarks present. Sloping spine. -- Re-Read is a social enterprise that trades in and recycles books to reduce waste, save them from landfill and provide services and activities that promote literacy, education attainment and quality of life in South Yorkshire and supports Askern Community Library. All overseas shipping is via Airmail. . Good. Time Warner Paperbacks. PAPERBACK. 0751514209 Book is in good condition. Cover has some wear. Fingermarks present. Page discolouration present. Creasing present. -- Re-Read is a social enterprise that trades in and recycles books to reduce waste, save them from landfill and provide services and activities that promote literacy, education attainment and quality of life in South Yorkshire and supports Askern Community Library. All overseas shipping is via Airmail. . Good. 1995. London: Warner. 12mo, 245 pages, illustrated. Film tie-in (Jim Carrey, Nicole Kidman). Based on a screenplay written by Lee Batchler & Janet Scott Batchler and Akiva Goldsman. . Very Good. Paperback. 1st UK Edition. 1995.